An overcast day in Pretoria welcomed over 100 Monster Clash 2 contestants, all eager to claim their stake at winning their respective divisions (and the mountain of prizes that go with it). Also on offer was the Team Cup where the winners had the right to proclaim themselves the best in the country. 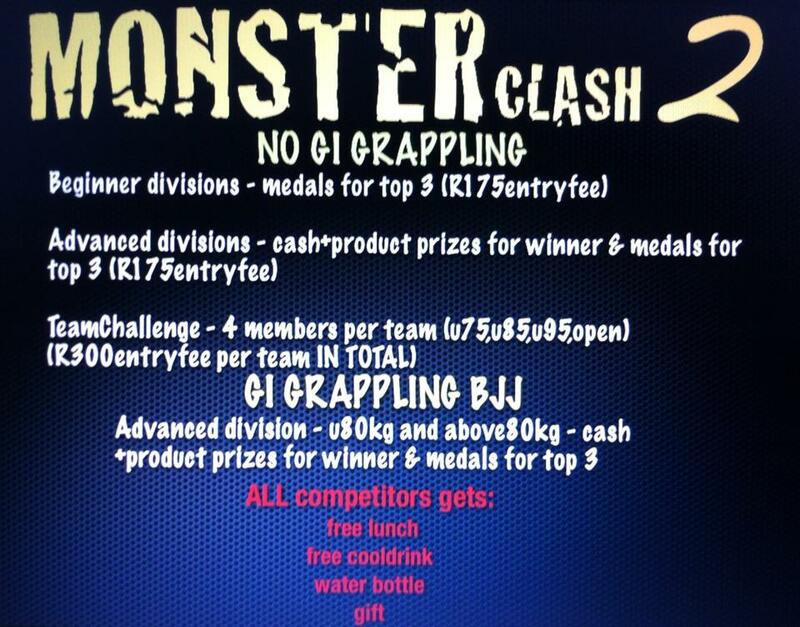 Monster Clash has in two events managed to propel itself to the unofficial South African Championships, with only the best risking their reputation on the Monster Clash mats. This is quite a feat and with an incredibly interesting announcement on the next event in June will have all BJJ fans excited. This division had an entertaining back and forth battle between Dino Bagattin and Brendon Lesar that went into 5 Overtime Rounds, which Lesar eventually took. Warren beat Michiel Opperman on his way to winning the division. Paul took the final 4 points to 2. The Team Cup Challenge had four teams competing for the right to claim that they are the best BJJ gym in the country. The format was that each team entered a competitor in the set weight division, the names would then be randomly chosen and the teams would then compete, the first team to win 2 matches would advance. The teams were allowed to choose a lighter competitor to compete but not a heavier one. The Team Cup started with Team CIT clashing against Mark Robinson Academy, the weights chosen randomly was the under 85kg and over 95kg classes. 1st Match Under 85kg had Adam Speechly representing Team CIT against Dave Aghion representing Mark Robinson Academy. Dave Aghion won this via points. 2nd Match Over 95kg had Niel du Plessis representing Team CIT against Dwain Meredith representing Mark Robinson Academy. Dwain Meredith won this via points. The Team Cup continued with Team PEFSA taking on Team Rio Grappling Lowveld, the weights chosen randomly was the under 75kg and under 85kg classes. 1st Match Under 75kg had Jordan Machtle representing Team PEFSA against Lourens Botes representing Team Rio Grappling Lowveld. 2nd Match Under 85kg had Cameron Pritchard representing Team PEFSA against Jedri Koekemoer representing Team Rio Grappling Lowveld. The Team Cup Final now lay ahead with all the competitors ready to claim top honours, some pushing through exhaustion, others through injury, all of them had their eyes on the prize: Top BJJ Club in the Country. 1st match of the Team Cup Final was then Cameron Pritchard representing Team PEFSA facing off against Dino Bertolis from Mark Robinson Academy. Dino Bertolis took this match on points giving his team one step closer to the title. 2nd match of the Team Cup Final was a do or die for Team PEFSA. You had Warren Allison representing Team PEFSA against Tal Bugai representing Mark Robinson Academy. Warren Allison takes it by 5 points to 4 and gives Team PEFSA a step next to Mark Robinson Academy. The tie breaker was then pulled at the weight class of Over 95kg, with Rudolf Reeders representing Team PEFSA taking on Dwain Meredith representing Mark Robinson Academy. The winner of this would win the Team Cup for his gym. Rudolf Reeders takes the win by points and crowns Team PEFSA as the inaugural Monster Clash Team Cup Winners, giving them bragging rights as the top BJJ gym in the country.